I had the pleasure of working side by side with Oscar on several occasions over the years from Singapore to Toronto promoting his couture collections and his globally beloved classic fragrance OSCAR. He was gracious, funny, passionate and serious; not to mention the obvious, talented and a fashion icon. He made me laugh incessantly backstage with his quiet sophisticated demeanour. Mr. De La Renta always remembered me despite his universal recognition which made me feel special. On a very special appearance at CityTV with Marilyn Dennis, Oscar made a point to mention (on live national television) that the size of the dress I had to squeeze myself into was so small that he could see the Cheerio(s) I ate for breakfast. That became the on-going joke that went from backstage to on-camera and was an endearing characteristic of his charm. Oscar De La Renta leaves behind a fashion legacy that spans from 1963 to 2014. 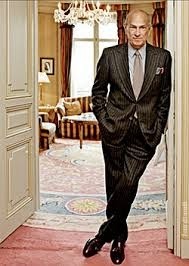 De La Renta was recognized as a Commandeur to the Legion D'honnuer by the French governement and was awarded several titles of recognition, honours and was dedicated to his philanthropic endeavours.